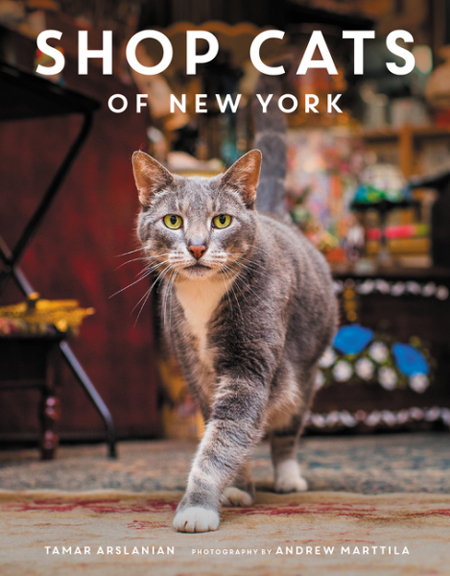 Yes, I'm slightly biased because I consider Tamar Arslanian, the author of Shop Cats of New York, a good friend. Yes, I'm kind of partial because New York City is my favorite place. OK, I like cats ... a lot. What I'm trying to convey is that it was a no-brainer when Tamar asked me to review her new book. Since I was a little girl, I've been ecstatic when I notice a cat hanging out in a shop. I swear it's still like a awesome surprise to me. I often become giddy and completely forgot why I'd visited the store in the first place. And then, after that day, I'd find an excuse to frequent that particular store. I love learning that the kitties are well cared for and loved by the owners, employees, and customers. They work hard, after all, and are the best hosts and hostesses ever. Never mind all the nap breaks -- they deserve them! Tamar, also the author of the popular blog, I Have Cat, Single in the City with Cat(s), wrote Shop Cats of New York because, well, she's like me. 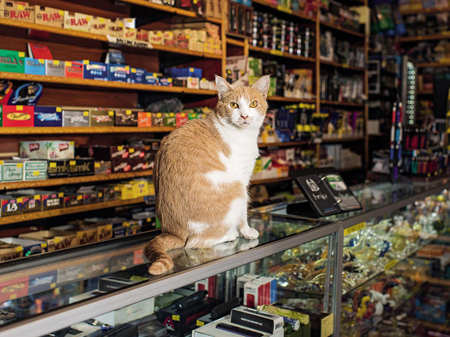 She loves noticing cats "working" in shops, and decided she'd do a little research and share the stories of the kitties who call the shops of New York City "home." She made a fantastic choice in asking Andrew Marttila, a gifted photographer, to capture the images of the cats in the book. He and Tamar both have the lovely ability to truly acquaint the readers with the feline "employees." Shop Cats of New York is an easy read because it's categorized by cat. It's the perfect coffee table book and gift for your cat-loving friends. I feel so grateful that Tamar and Andrew took the time to feature these felines who are loved by locals, but virtually unknown to those of us who live outside of NYC. Now I need a destination vacation to meet all of these cats! Cosmo's jealous and mesmerized about what happens outside his four walls. 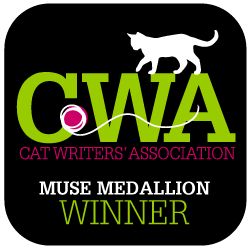 You can purchase Shop Cats of New York on Amazon, or anywhere you buy books. Be sure to follow Shop Cats on Facebook and Instagram. Need to see more? Of course you do. Here's a short promotional trailer for this must-have book! The publisher gave us a copy of Shop Cats of New York; however, Catladyland only shares information we think our readers would enjoy.